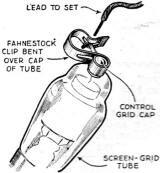 If MacGyver had been around in 1935, every episode would have included a Fahnestock Clip as part of a scheme to get Angus (his first name - no kidding) out of perilous situations. 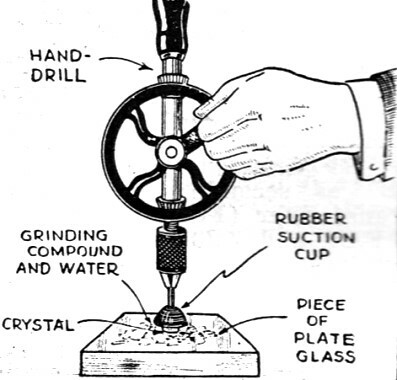 The handy little devices were very popular in electronics, both for hobbyists and for commercial products, until fairly recently (within the last two decades) because they provide a simple, reliable electrical connection that does not require any tools for use - other than your finger. If you have never heard of a Fahnestock clip, you will probably be surprised to learn what it is and chances are you have seen one and maybe even used one. If you work in an electronics prototyping lab area that has been around for a while, there are almost certainly some in a parts bin somewhere or on some old mock-up gathering dust in the corner. 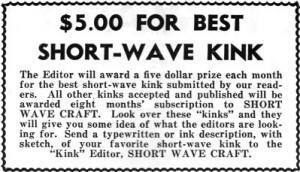 I mention Fahnestock clips because this 1935 edition of Short Wave Craft shows them being used in two of their monthly hints and kinks page. BTW, I never have been really comfortable referring to a 'kink' in a discussion of a solution to a problem since Merriam-Webster defines a kink as "a small problem or flaw." It is still done routinely today in hobby and professional technical magazines. Oh, and the $5 prize in 1935 is equivalent to $86.19 in 2014 per the BLS Inflation Calculator. This sketch as drawn shows how I have put to good use the prongs removed from tube bases. The advantage of being able to remove the coils (5 meter) for any necessary change or adjustment can be seen at once. The ICA socket was chosen because the double contact within the socket held the coils firmly in place and practically eliminated the possibility or poor joints and noise. One suggestion - solder the connections well, using rosin core solder. 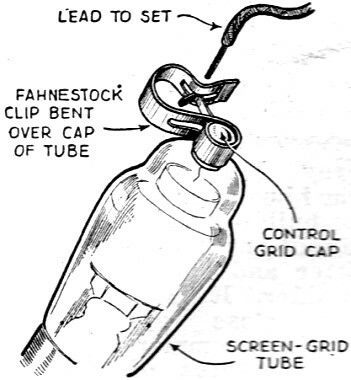 "Tin" the ends of each coil end before inserting it into the prong. Do a thorough job the first time! You won't have to do it over again and the results will be well worth the additional effort. 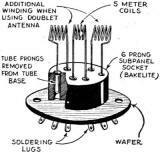 Many short-wave "Fans" have found occasion to employ a screwdriver made of some insulating material for adjusting trimmer condensers in antenna circuits or I.F. transformers. 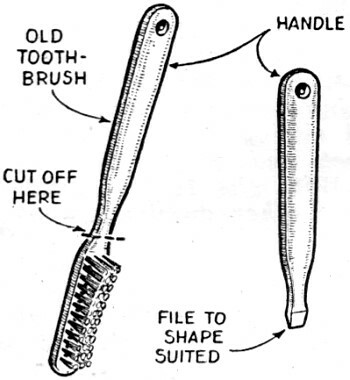 By removing the brush portion of a discarded tooth brush and filing a flat edge on the handle, an excellent non-magnetic screwdriver can be made. 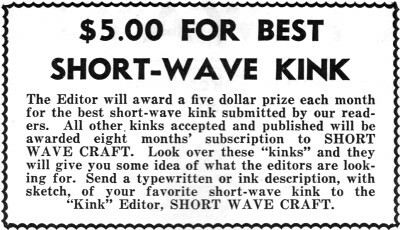 I trust this kink will be of value to the readers of Shot Wave Craft magazine. Fringe howl and motorboating may be eliminated by simply placing a resistor across the secondary of the A.F. transformer leading to the troubled stage. This method does not give maximum results. The resistor is to drain off audio voltage, but if it is too low a value, you will get weak signals. If it is too high, the receiver will howl. 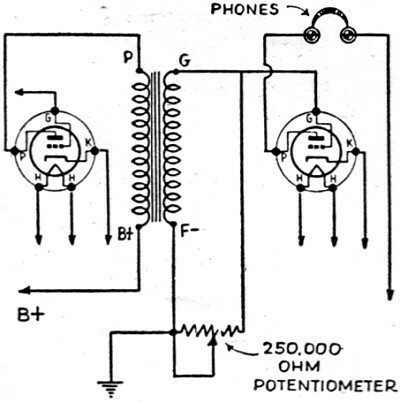 To get best results, put a 250,000 ohm potentiometer across the secondary of the audio transformer so that the optimum resistance may be found. 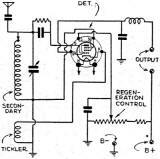 This potentiometer also acts as a smooth working volume control. I find this system very successful and satisfactory. 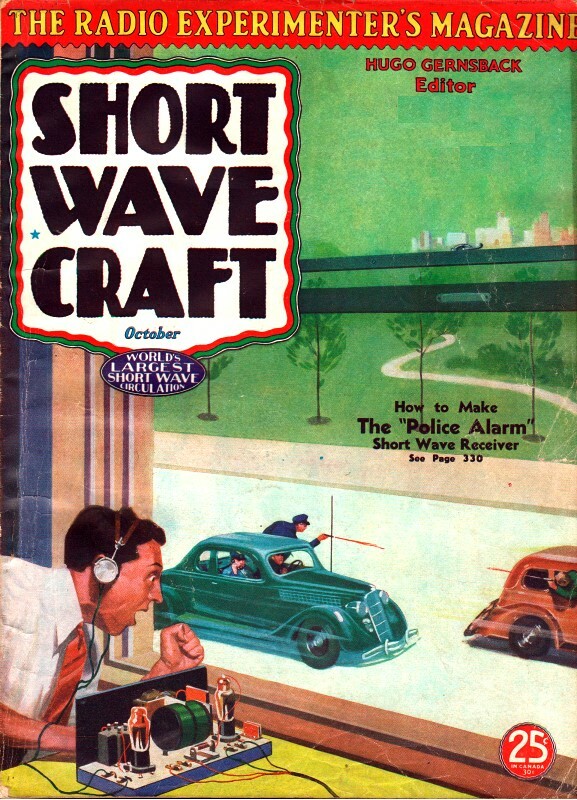 Here is my favorite kink and I hope that it is published in Short Wave Craft. 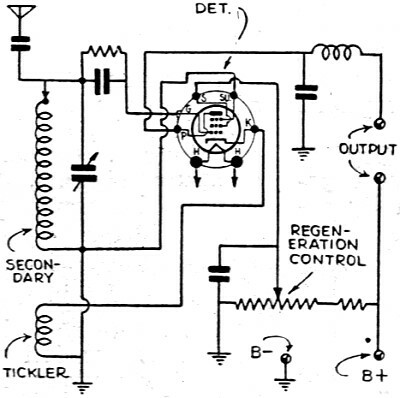 A center tapped push-pull input transformer may be connected as shown in the diagram and will make an excellent code practice oscillator. The oscillation is very good and it has an excellent tone. The tone of course, will depend a lot upon the tube and make of transformer used. 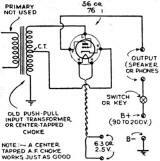 Either a 56 or a 76 tube will work very nicely; 6.3 volts are used for the 76., while 2.5 volts are used for the heater of' the 56. 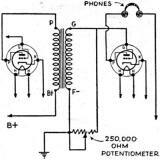 The output of this oscillator is sufficient to operate a small speaker with excellent volume. Probably many S.W. "Fans" have pondered over the inconvenience of adjusting the antenna condensers with a screwdriver. Here is my solution to the problem. 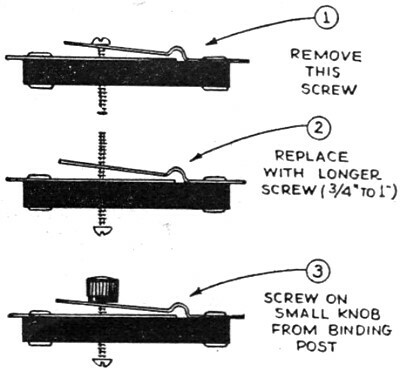 The small knob serves as an insulated hand adjustment and forces the movable plate down very evenly. 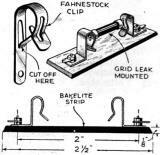 Many set builders use grid-leak mountings and here is a stand made from two Fahnstock clips, one inch in length. Details of how to make this two-cent G.L. stand are shown in the diagram. This stand is very rigid and holds grid-leaks very tightly. The clip (F.C.) should be shaped out, as shown in plan. The clips (C) should then be mounted on the strip of bakelite (B) with screws (S) together with the soldering lugs (L). A hole should be drilled in the center of the strip of bakelite for mounting. Here is a kink that I would like to enter in the short-wave kink contest. 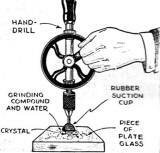 In grinding crystals I used the regular method of a piece of plate glass, grinding compound, and water. 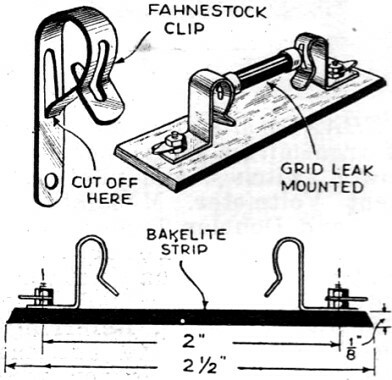 In one of your issues you published a kink employing a Fahnstock clip as a connection for the control-grid or a screen-grid tube. The illustration shows a much better way to use this slip for the same purpose. These clips are obtained from discarded "B" batteries and are ideal for this purpose because they have exceptionally long ends. Here is a kink that has helped to bring in many DX stations. All that is needed is a round eraser and a piece of fairly stiff brass. 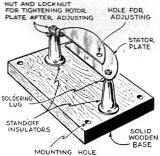 The eraser is fastened to the bracket and the bracket to the panel with small bolts. A station is tuned in with the dial and for fine adjustment a little pressure on the eraser and a beautiful vernier is the result. 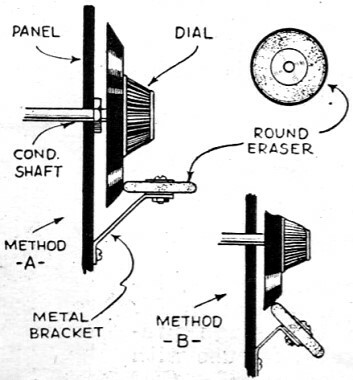 If a small dial is used the eraser may be mounted on a bracket so it touches the edge of the dial as in B. Here's a kink for eliminating hum, that will save a good many experimenters a good many dollars in power supply filter. When the power supply is built, place the power transformer in its permanent position, and then with nothing else mounted in the power supply, turn on the transformer. Connect a pair of headphones across the filter choke. An "induction hum" may be heard. By turning the choke at various angles, a location will be found where no hum is audible in the headphones. Locate the choke in that position permanently, and then wire up the power supply and filter. Using this system, it is often possible to get complete filtering with only one 5 henry choke and two 1 mfd. condensers. 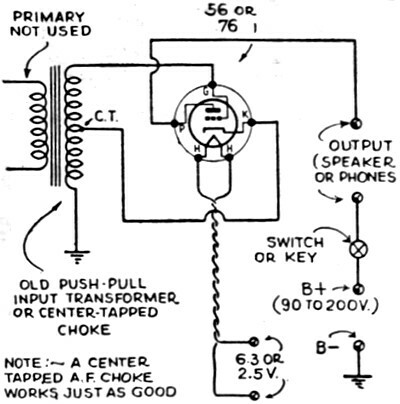 The proper location for microphone transformers, audio transformers, modulation chokes, etc., may also be found in this manner when it is necessary to mount these units on the same base as the power supply. 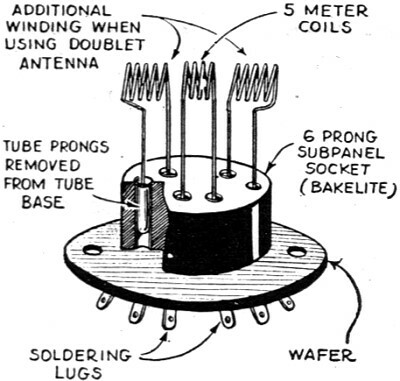 A condenser that can be used as an antenna trimmer on receivers or as a neutralizing condenser on transmitters can be made from two midget stand-off insulators and two stator plates from an old discarded variable condenser. The stand-off insulators used are about 1 5/16" high. 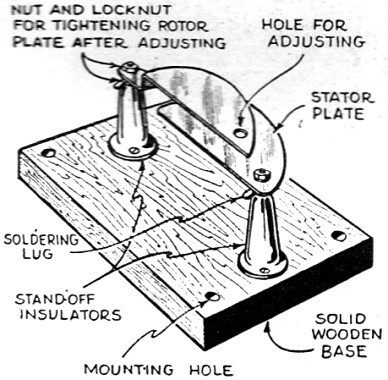 A bakelite or wooden rod that is pointed is used to adjust the rotor. When the neutralizing adjustment is made, the rotor can be locked into place by tightening the nut indicated on the diagram. Here is my kink which I hope will be given consideration when you decide the winner for the best kink of the ones submitted. It is a method by which a two-circuit detector using the regeneration control in the screen-grid circuit may be converted into an electron-coupled detector. Only a few changes need be made in the wiring, and no extra parts need be added to the detector. Since the electron-coupled detector is more preferable than the usual two-circuit detector, readers of your magazine will find this kink valuable. I have enclosed a short description and a diagram of' the kink, which I think every radio "Fan" can easily use to his advantage.